I messed myself up with this book. When I saw the title, my mind wanted to insert a ‘the’ in the title. It is not ‘canoeing the Mississippi,’ but canoeing the waters of the State of Mississippi, broken into seven regions plus the state’s lakes, refuges, state parks, national forests, and even water parks. So after being a bit put off by missing a chance to vicariously paddle down the Mighty Mississippi, and then again on finding that the author doesn’t even like the river all that much, I still felt the book draw me in once I got into it. Ernest’s experiences on the state’s waters began in the 1970’s. He introduces us to the different types of paddle boats that have been used on the local waters, and the more modern boats most suited there now. He takes you through the flora and fauna likely to be encounters, like 16-ft. alligators, 50-lb catfish, black bear, 6-ft timber rattlers, quicksand (mostly shallow), whirlpools, suckholes, and a bumper crop of cottonmouths. We are introduced to the Deinosuchus, the 30-ft and 10,000 pound ancestor of the alligator. I saw a skull fossil of this beast at the Kaw Nation Museum, in Oklahoma, and was more than impressed. The reader is introduced to the region through the Natchez, Choctaw, Chickasaw, Creeks, Cherokee, whose fishing weirs have been dated to 1350, then the Spanish, French, and British that opened the area to whites, to those who began to settle. Herndon has done a massive amount of historical research that adds tremendously to the fascination with the region. We meet Lewis Wetzel in the 1760’s, who became the nation’s most famous Indian fighter. We come upon Andrew Jackson when he was proprietor of a store. Ulysses S. Grant crisscrossed back and forth through the area. We meet J.L. ‘Casey’ Jones in 1900 just before he runs through a railroad stop signal, orders his fireman to jump for his life, and crashes into a freight train, killing himself. 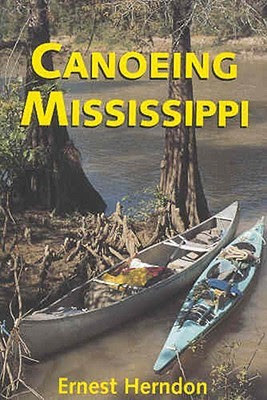 In fairness to the reader, however, this is less a casual read, and more of a manual for the dedicated paddler venturing onto Mississippi’s waters. While the book is a decade and a half old, the one thing obvious in the reading is that the state’s government at that time was slower to realize the recreational value of their own state than the author, as evidenced by the poor availability of access points to the rivers and streams. Reviews of each waterway are thorough, listing both the good and bad points to be encountered.